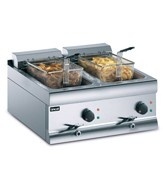 Gas counter top fryers are useful appliances for small catering operations, for instance mobile catering vans or small cafes, or for specific purposes in larger operations, simply to increase capacity at peak trading or to be used for particular foodstuffs such as vegetarian food or tempura battered food that you wish to keep separate. Lincat produce an excellent range of gas counter top fryers, single tank and twin tank in both natural gas and propane gas. 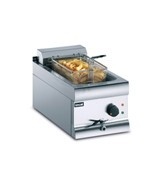 Take a look at our fryer buying guide for general information on fryer types and features to look out for.